A Female Peasant of Ingria. Home » A Female Peasant of Ingria. THE Russians made a conquest of Ingria (Finnish: Inkeri or Inkerinmaa) about the commencement of the last century. At that period the inhabitants of the flat country consisted of a Finland race, differing, but little, in their language and customs, from the Fins of Carelia. This people were called Ischorzi, from Ischora, the name of a small river, which has its entrance on the left bank of the Neva. The men dress precisely the same as the peasantry of Finland; but, in this respect, the women of Ingria betray a greater portion of vanity than the females of that country. The neck and bosom are covered with several rows of glass pearls, and the ears are ornamented with a profusion of ear-drops. The unmarried women wear the hair in tresses, and uncovered. In their visits to the towns, they commonly wear a Russian cap, called Kakokschnik: to this cap is added a small pointed piece, which projects from the forehead; it is lined with fur, and sometimes trimmed with lace. Over the chemise is worn a long mantle or cloak, made of cloth or stuff, and fastened at the bosom with buttons. The Ingrians abound in superstitious opinions, and pagan doctrines. They purchase their wives, and after the nuptials treat them with the utmost severity. A priest assists at the burial of the dead; but these deluded people return to the grave during the night, in order to furnish the deceased with provisions: this is repeated several times. It is their general opinion that we continue to live under ground, in the same manner as when on the surface of the earth, and that the tomb is only the dwelling place of the dead t fear. Some friends of the author of this work, acquainted with the Finland language, one day surprised an Ischorian woman in the neighbourhood of St. Petersburgh, and listened to her without being observed: a fortnight after the death of her husband she had married again, and to appease the manes of her departed spouse, she had repaired to his grave, where they discovered her prostrating herself, and uttering groans and lamentations. 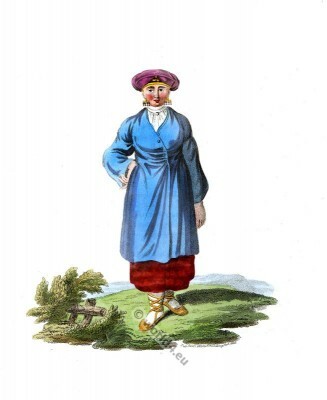 This entry was posted in 1803, 19th Century, Finland, Russia, Scandinavia and tagged Edward Harding, Traditional Finland Costumes on 11/1/14 by world4.